This is insane! Man, things youth do, thinking they are immortal and invincible. Plus, there’s the money. Definitely a risk vs. reward thing to do; these high-speed illegal street races. Faster & furiouser. Watch! Motorcycles rule the streets of Indonesia. By day, the bikes zip through Jakarta, ferrying residents to and from work—but by night, the roads give way to the underground world of illegal street racing. Kids as young as 12 compete in the high-speed sprints, where riders can make a small fortune off a single race. The rewards are great, but the risks are just as high: Flying down roads at breakneck speeds, one, small mistake can cost a “speed jockey” their life. On this episode of ‘VICE INTL,’ VICE Indonesia went inside Jakarta’s dangerous, high-stakes street racing scene. 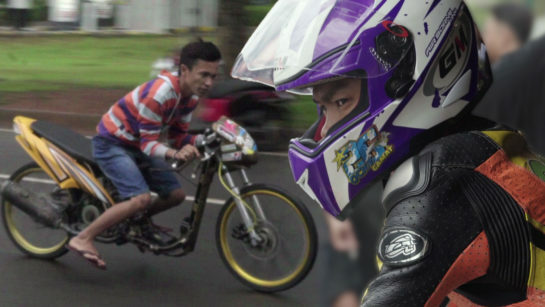 We met up with a 16-year-old rising star to hear how he got involved, talked to the cops cracking down on illegal drag racing, and checked out a sprint ourselves—watching as two teenagers faced off for more cash than most Indonesians make in a month.